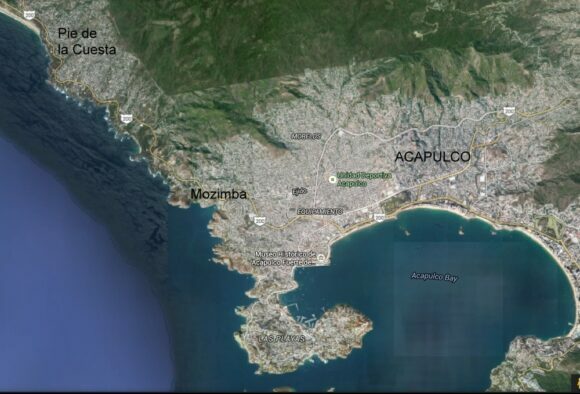 A new highway linking Mozimba and Pie de la Cuesta has been formally inaugurated in Acapulco. According to the SCT (Communications and Transportation Secretariat), the $37 million highway will benefit 860,000 people living in Acapulco and Coyuca de Benítez. On average, 18,000 vehicles are expected to use the highway each day. The highway reduces travel times from about 30 minutes to 10 minutes. It is easy to forget how rapidly transportation systems have changed since the horse and buggy days. The completion of the Mexican stretch of the Pan-American Highway (i.e. the part from the U.S. border to Guatemala) in the late 1940s was a significant turning-point in the development of Mexico’s road network. The highway made previously remote areas more accessible. It also served as a symbol of unity and Mexico’s progress into the modern era. 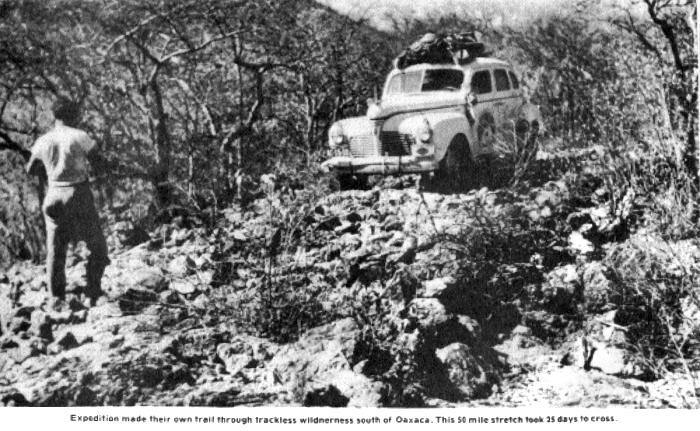 Prior to its completion, only a handful of intrepid souls had dared to attempt driving the entire route of the Pan-American Highway through Mexico. 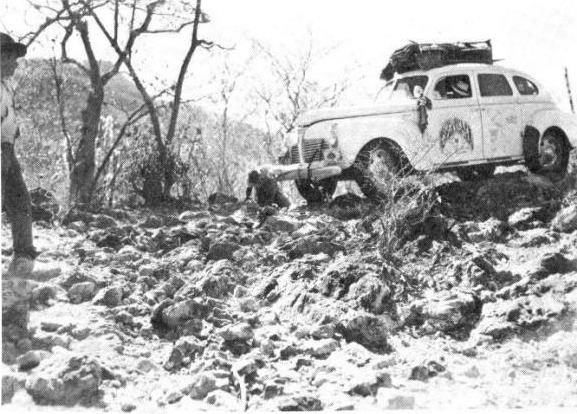 The most noteworthy expedition was the three-man Richardson Pan-American Highway Expedition of 1941. Amazingly, with only occasional assistance from mules, trucks, passers-by and boats, this expedition successfully drove all the way from Detroit in the U.S. to Tierra del Fuego, Chile. The three men – christened “The Three Damn Fools” – were journalist Sullivan Richardson, Arnold Whitaker and Kenneth C. Van Hee. The car they used was a 1941 Plymouth 4 door sedan, serial No. 15031250, engine number P11-214804. “The Richardson Pan-American Highway Expedition is perhaps one of the greatest automotive stones of all time. In scope and magnitude it surpasses those pioneer automobilists that first crossed the United States at the turn of the century The Richardson Expedition crossed not only this country but encompassed the area spanning two continents-crossing trackless wilderness, endless mud, uncharted territory and obstacles of every sort that Mother Nature could throw against them. The whole epic story, complete with photos, can be read online here. The story and photos originally appeared in issues #135, #136 and #137 of the Plymouth Bulletin (1982). Sullivan C. Richardson: Adventure South (Arnold-Powers Inc., 1942). Mexico’s official online database of all the country’s roads and highways has just been updated. As of May 2015, Mexico has a total of 322,859 kilometers of roads and highways. 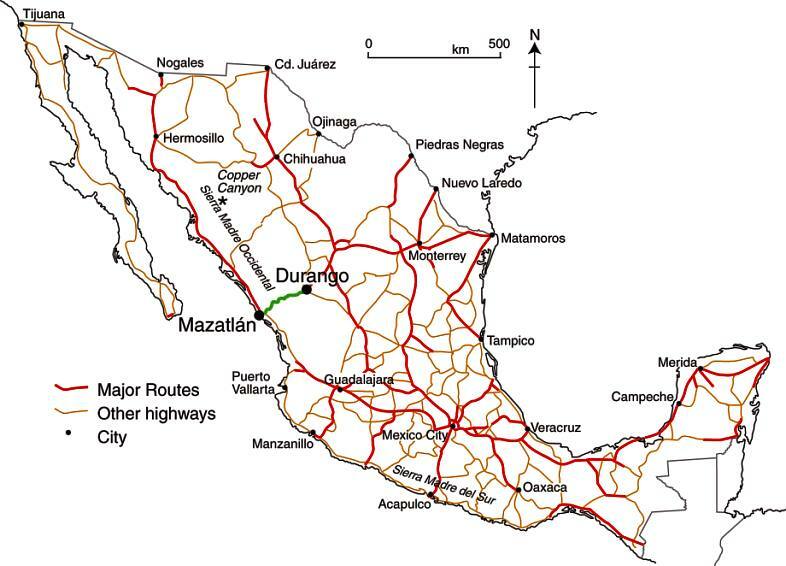 Mexico’s major highways, 2009 (Fig 17-3 of Geo-Mexico, the geography and dynamics of modern Mexico). All rights reserved. 118,812 km of rural (unpaved) roads. The highway network connects 25,844 places, and has links to 39 ferry routes. It also includes 847 toll stations, 3476 bridges and 178 tunnels. According to the report, Mexico currently has 6480 gas stations. However, this number is expected to increase rapidly in the next few years as competitors enters a market over which PEMEX previously held a monopoly, prior to recent energy reform laws. If you are planning to drive across Mexico, then the online system at http://ttr.sct.gob.mx/mappir/ will give you routes, distances and estimated times and costs. 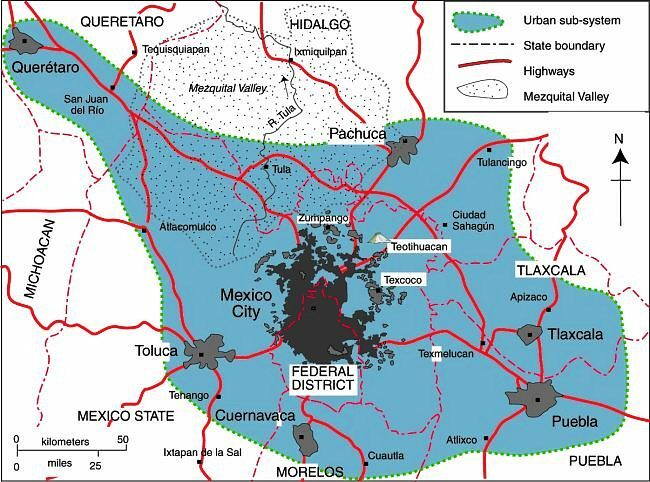 The Mexico City Metropolitan Area (dark grey on the map), which occupies the Valley of Mexico, extends well beyond the northern boundary of the Federal District and includes many municipalities in the State of Mexico. The two administrations (the Federal District and the State of Mexico) have to work closely together in order to coordinate actions in the Metropolitan Area, which had a population in 2010 of 20.1 million. Toluca, the capital of the State of México, is Mexico’s 4th largest urban area, and a fast-growing industrial city in its own right, with a 2010 population of 1.8 million. Toluca’s airport (the “Licenciado Adolfo López Mateos International Airport”) is mainly used by low-cost carriers like Interjet, Volaris and Aeroméxico Connect as an alternative to using the Mexico City International Airport, which is more expensive and operating at close to capacity. Passenger traffic through Toluca airport has grown rapidly, from 145,000 passengers in 2002 to a peak of almost 4 million in 2008, before falling back to about 1 million passengers in 2012. Not surprisingly, the Mexico City-Toluca highway is one of Mexico’s busiest major routes, linking the Federal District via Toluca (see map) to western Mexico. To ease the situation of Mexico City International Airport, the federal Communications and Transportation Secretariat (SCT) plans to expand the airport eastwards, onto 5,500 hectares of federal land. The expansion is likely to take several years to complete, and will increase flight capacity even though it will not include an additional terminal. Meanwhile, State of Mexico authorities have authorized a second runway for the Toluca International Airport, which will significantly expand that airport’s capacity. The SCT has proposed that Toluca Airport become an alternate airport for Mexico City, with the two airports linked by high-speed trains. The SCT has already announced that a new rail link between Toluca and Mexico City will be jointly financed by the federal government and the State of Mexico. The existing plan is for the first phase of the “Toluca-Valley of Mexico Interurban Passenger Train” to end at the Metro Observatorio station in Mexico City, but a later phase would extend this line to Mexico City Airport. This new 2.7-billion-dollar rail line, capable of carrying 300,000 passengers a day, will run from Toluca via the upscale Mexico City neighborhood of Santa Fe to Metro Observatorio, reducing the travel time between Toluca and Metro Observatorio by more than an hour to around 40 minutes, with corresponding positive environmental impacts. Construction of the new line, which will include 4 intermediate stations, is due to begin later this year, and scheduled to be completed by 2018. A separate 115-million-dollar project is underway to reduce highway congestion between Toluca and Mexico City. To boost the road transport capacity between the two cities, a multi-lane second tier is being added to 15 kilometers of the existing Mexico City-Toluca highway, from La Marquesa to Paseo Tollocan, at the entrance to Toluca. President Enrique Peña Nieto has officially opened the new Durango-Mazatlán highway which has taken more than a decade to complete. He inaugurated the new highway early today (17 October), Mexico’s annual “Road Workers’ Day” (“Día del Caminero”). The new 1.2-billion-dollar, partly 4-lane, 230-kilometer highway will slash the time taken to drive from the city of Durango to the Pacific coast resort of Mazatlán, from 5 hours to about 3 hours. It is by far the single most important and complex road project in Mexico in recent years. Mexico’s major highways (Fig 17-3 of Geo-Mexico, the geography and dynamics of modern Mexico). All rights reserved. 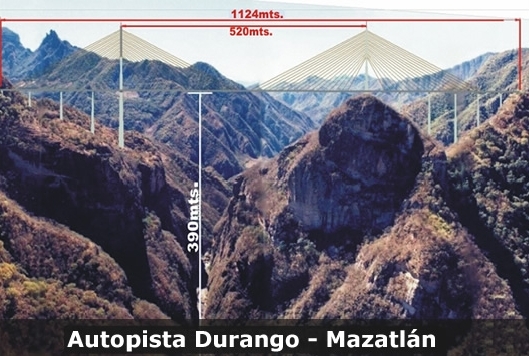 The most spectacular part of the highway is the Baluarte Bridge (Puente Baluarte), the tallest cable-stayed bridge in the world, which straddles the border between the states of Sinaloa and Durango and circumvents the need to negotiate the twisting and dangerous route taken by the old highway through the Espinazo del Diablo (Devil’s Spine). The Baluarte Bridge is a 1,124-meter-long bridge that rises almost 400 meters above the river below. The highway also includes 63 tunnels, the longest of which (El Sinaloense) is 2800 meters in length. The firms involved in constructing the highway included Omega Corp, Tradeco Industrial, FCC Construcción, La Peninsular Compañía Constructora, Grupo Mexicano de Desarrollo and Grupo Hermes. The highway has four toll booths; car drivers will pay about $500 pesos in total for a one-way trip along the entire length of the new highway. The highway is expected to carry 3,000 vehicles a day during its first year of operation, a figure expected to rise to 6,000 vehicles a day within the next six years. Note: We are still waiting for a first-hand report from anyone who has driven the new highway. While the highway has been officially opened, at least one section of the highway is not yet open to regular traffic because of on-going repairs due to damage sustained during last month’s storms. It currently takes about 5 hours to drive from the city of Durango to the Pacific coast resort of Mazatlán, but this time will be slashed to under 3 hours once the new 1.2-billion-dollar, 4-lane, 230-kilometer highway between the cities is complete. The Baluarte Bridge is already in place and was officially opened in January 2012, but the highway is still incomplete and not yet open. The highway is due to be completed by later this year, rainy season permitting. This post features two videos about the Bridge. The first 4-minute video (below) is in English and is a promotional short for VSL International, one of the construction firms building the bridge. It includes footage of the amazing building techniques that were required. The main span of the Baluarte Bridge is 520 meters in length and is 402 meters above the river (rather than the 390 m in the picture below), making it not only the tallest cable-stayed bridge in the world, but the cable-stayed bridge with the longest span in the Americas. The second video (below), first aired on National Geographic channels in Latin America, is 43 minutes long and entirely in Spanish (no subtitles). Its English-language equivalent, entitled Megastructures: World’s Highest Suspension Bridge, has been shown in the USA and Canada, but is not currently viewable online. There is a minor geographic error in the first minute of this video when it shows a graphic placing the Baluarte Bridge at the junction of two distinct highways (Durango-Mazatlán and Tampico-Durango). The producers have taken some “geographic license” here since the two highways actually meet in the vicinity of the city of Durango, a considerable distance east of the Baluarte Bridge, which is more properly located on the boundary between the states of Durango and Sinaloa, mid-way between Durango and Mazatlán. While this Spanish language version is quite long winded in places, it includes some spectacular photos and graphics, including the celebration held when the two crews working from opposite sides of the ravine finally met each other in the middle! In order to ensure safety, the Baluarte Bridge is kitted with an array of sensors which send real time information to engineers in Mexico City who can monitor every aspect of the bridge and its response to every change in wind direction, strength, traffic, etc. The construction project is not without its critics. While tourism officials expect a massive increase in the number of visitors to Mazatlán, and a doubling of the number of hotel rooms in that resort in the next 10-15 years, the local residents of several villages and ejidos along the route of the new highway claim they have not yet been fully paid for allowing construction crews access to their property or compensated for the damage caused to their pine forests, farmland and water supplies. The new highway may also “change the criminal dynamic” in this mountainous area, the more remote parts of which have a long and troubled history of violence and drugs trafficking. We’ll post again about this astonishing engineering achievement when the new highway is completed and open to regular traffic, hopefully later this year! Meanwhile, it’s back to drawing an updated version of Figure 17.4 of Geo-Mexico, the geography and dynamics of modern Mexico (currently on special offer at Amazon.com), a map showing the average driving times by road from the city of Durango to everywhere else in Mexico. Despite earlier claims that the Durango-Mazatlán highway would be completed before the end of this year, government officials have now confirmed that the highway will not be finished, and will not open, until sometime in 2013. There is still no date for the official opening of the new Mazatlán-Durango highway, but it is now certain that it will not enter service until early 2013, according to press reports. The eastern part of the highway (in Durango state) is expected to be completed before the end of this year. 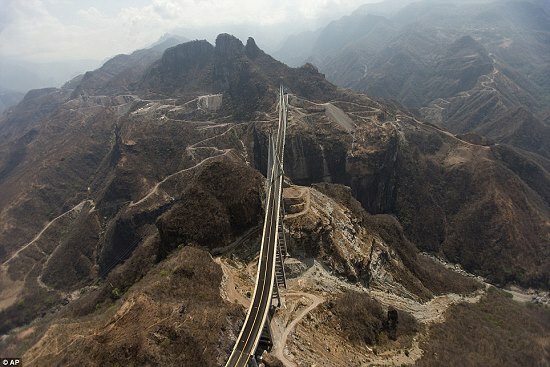 However, it will be impossible to bring this section into use until the western part of the highway (in Sinaloa state) is completed, because the route of the new highway is very different to the existing highway and it would be too expensive to connect the two. The section of the highway in Sinaloa is reported to be still missing key pieces, including an important bridge. Earlier today, President Felipe Calderón inaugurated the Puente Balarde, the world’s tallest cable-stayed bridge. The bridge is 1.124 km long and wide enough for 4 lanes of traffic. Its central span extends 520 meters. At its highest point, it is a gravity-defying 403 metres (1322 feet) above the River Baluarte from which it takes its name. The bridge’s largest supporting pillar is 153 meters high, with a base measuring 18 meters by 30 meters. Construction, by Mexican firm TRADECO, has required 103,000 tons of cement and almost 17,000 tons of steel. The bridge joins the states of Durango and Sinaloa and removes the need for drivers to negotiate a very dangerous stretch of highway known as the Devil’s Backbone. It is the centerpiece of a new highway between Durango and the Pacific coast resort of Mazatlán. The 312 km drive between the two cities, which took about five hours prior to the completion of the bridge, will now be dramatically shortened. “This project will unite the people of northern Mexico as never before,” President Calderón said at the inauguration ceremony. Accordoing to the BBC, officials from the Guinness World of Records were on hand to present him with an award recognising the engineering feat. The previous record holder was the elegant Millau Viaduct in France. Even though the bridge has been inaugurated, the new Durango-Mazatlán highway is still many months from completion.